One of the biggest snakes in the world, these powerful ambushing constrictors are native to Southeast Asia. The nocturnal python lives in forested plains and hills, usually close to water. They can grow up to 6 meters (20 ft) long and weigh up to 180 kg (400 pounds) but despite their size they are excellent swimmers and can stay submerged for up to 30 minutes. Females of this species are typically larger than males and can lay 30-50 eggs per year. They feed on big mammals. 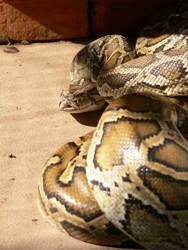 If a Burmese Python has overwhelmed and swallowed a big prey, it will not hunt for months. These snakes are frequently killed for their meat and their beautiful skin to make leather. They are also used for the production of traditional medicine. The reticulated Python lives like the Burmese Python in forested regions of Southest-Asia and its isles and archipelagos. Reticulated pythons show a high degree of adaptability and often live near to human settlements, where they feed upon rats and chicken. This snake species may be even longer than the Burmese python. The record length of a snake caught on Sulawesi is 9,99 meters, so reticulated pythons are the longest snakes in the world. Also the females in this species grow much longer and get heavier than the males. In relation to their length, the reticulated python is rather slim. The females lay 10 to 40 eggs and set on to the eggs and breed them. The reticulated python is hunted because of its meat and its beautiful skin used for the production of shoes or bags, often for tourist’s souvenirs. In Tonle Sap Great Lake various species of water snakes occur. The Tonle Sap Water Snake (Enhydris longicauda) only occurs in Tonle Sap and nowhere else in the world. This makes it particularly vulnerable to extinction, particularly under the current rates of unsustainable harvesting. It is a gentle snake but possesses a mild poison to subdue its primary prey of small fish, frogs and crustaceans. Water Snakes play an important role in the lake’s ecosystem, not least as food source for nesting colonies of large water birds. All species of water snakes of the Tonle Sap are unsustainably harvested (c. 7 million per year!) to be sold as feed to the growing number of crocodile farms around the lake. This is causing large scale population crashes and negatively affects the lake’s ecosystem. In times of fish scarcity due to over fishing, fishermen have turned to the trapping of water snakes which has become an important livelihood strategy for many poor families but has resulted in the flooding of local markets with snakes causing a rise in human consumption. Living in the flooded forests surrounding the lake, these snakes are also under threat from deforestation and the conversion of forests to agricultural lands. 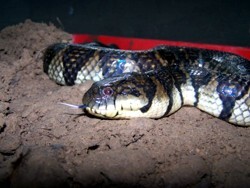 The photo shows a Bocourt’s mud snake (Enhydris bocourti). 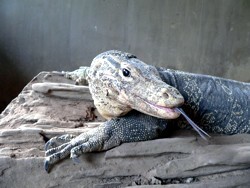 The Water Monitor is one of the largest monitors of the world. The long and slender lizard may grow up to three meters long. Its distribution area covers large parts of Southeast Asia. The Water Monitor is active at day and a very good swimmer, so it was able to settle many islands. The diet of the Water Monitor is highly variable: It feeds upon fish, crabs, small reptiles, mammals and birds as well as carrion. With its very fine nose, they are able to smell rotten carrion about many miles. Because of their size, adult monitors have no natural enemies. On the other hand, young monitors are often the prey of eagles, pythons and even adult Water Monitors. As a scavenger, monitors play a major role in the ecosystem. 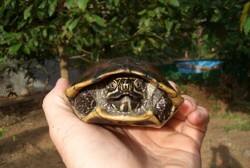 With a total length of 40 to 60 cm, the Yellow-headed Temple Turtle is one of the larger Asian swamp turtle species. Its distribution covers parts of Thailand, Cambodia and South Vietnam. The habitats of Temple Turtles are slow-moving and muddy rivers where they feed upon water plants and fruits falling down from trees. These are tortoises, different from turtles in that they do not live in the water. They feed primarily on fruits, vegetation, and mushrooms in open forest habitats. They are slow to reach maturity and only lay 2-8 eggs per year, but can live for over 70 years. Besides the destruction of their habitat the tortoises are threatened because of being hunted and traded throughout Asia for food. Their eggs are considered as delicacy as well. 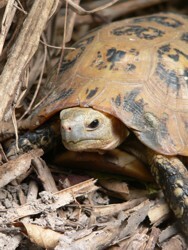 The slow reproduction of the tortoises compounds these threats. 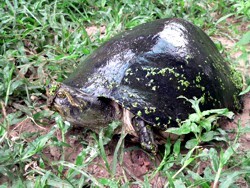 This small aquatic turtle feeds mainly on freshwater snails. It lives primarily in lowland ponds, marshes and flooded rice fields. Cambodian populations are globally important. This species is extremely prone to stress and lives solitary, which makes captive management difficult. As yet, there has not been any successful captive breeding. As said before, adults and their eggs are considered as delicacy. It is believed to bring good luck to release caught individuals into temple ponds where they die under over-crowded conditions with no appropriate food. There is currently very rare information about Caecilian. Caecilians are, with about 175 species, the smallest order in the class of amphibians. They do not have any limbs and are similar to worms. Also their way of life and their food is almost unknown. 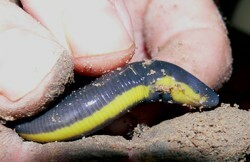 Most of the time Caecilians live in the upper soil layer and litter layer of forests.